Some of you, of course, are musicians who own real external instruments, as opposed to the options available in Mac’s GarageBand. If you’d rather not use the onscreen keyboard to control software instruments, you can connect a MIDI keyboard through a USB cable (on most newer gear) or a MIDI adapter (on older equipment). MIDI is geek shorthand for Musical Instrument Digital Interface, a standard that has been around for years. MIDI over Wi-Fi or MIDI over Bluetooth are also options on some newer devices. You can connect electric guitars, woodwinds, and drums through MIDI or through an audio interface with the proper ports and cables you might need. Click the red Record button when you’re ready to rock. Move the playhead to just before where you want to start jamming. If the high-quality instrument you have in mind is your own singing voice, connect a microphone (in lieu of the Mac’s built-in microphone) to an audio input port on the computer. You’ll have to let GarageBand know the input or source of the instrument. Open System Preferences, click Sound, click Input, and then select Line In. Drag the Input volume slider to an appropriate level. Back in GarageBand, choose Voice from the library and then choose the instrument that most closely matches your singing (or talking) style, such as Classic Vocal, Fuzz Vocal, and Telephone Vocal. It’s a good idea to sample these styles before committing to one or the other. 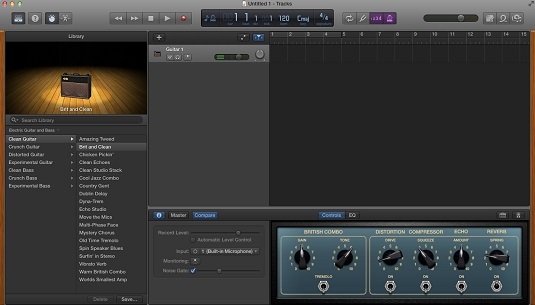 If you choose to use GarageBand with a real guitar or bass (for example) and let GarageBand serve as an amp, click the Smart Controls button in the toolbar. Here, you see some of the knobs, buttons, and sliders that you can play with to get your music just right with a virtual guitar.